Wishbone is a brand that flew under the radar until a short time ago. This New Zealand based dog food company uses only premium ingredients making them a great choice for dogs that are sensitive to a lot of other foods. Contains 93% protein from wholesome lamb and fish. No corn, by-products, or cheap fillers that have no nutritional value. Blueberries and cranberries provide antioxidants to boost immunity for a long and healthy life. Essential vitamins and minerals from natural botanicals like peppermint and basil. Fish and fish meal provides a lot of Omega-3 and 6 fatty acids to encourage healthy skin and coat. This food is definitely premium, but that comes at a steep price. It may not be feasible to get dog food shipped in all the way from New Zealand, though they definitely are on top of it when it comes to raising pastured meat. This food would benefit a dog that has a lot of sensitivity to grains and needs a minimal ingredient formula. Even at this price point, it is probably less expensive than a lot of prescription dog foods. Lamb Meal, Potatoes, Tapioca, Chicken Fat, Peas, Fish Meal, Blueberries, Cranberries, Papayas, Mangos, Apples, Basil, Oregano, Rosemary, Thyme, Sunflower Seeds, Chamomile, Peppermint, Camelia, Natural Flavor, Vitamin E Supplement, Niacin (Vitamin B3), Calcium Pantothenate (Vitamin B5), Vitamin A Supplement, Thiamine Mononitrate (Vitamin B1), Riboflavin Supplement, Pyridoxine Hydrochloride (Vitamin B6), Vitamin B12 Supplement, Vitamin D3 Supplement, Folic Acid (Vitamin B9), Sodium Chloride, Taurine, Choline Chloride, Magnesium Sulfate, Zinc Sulfate, Ferrous Sulfate, Calcium Carbonate, Copper Sulfate, Manganese Sulfate, Calcium Iodate, Cobalt Sulfate, Sodium Selenite, Green Tea Extract, Rosemary Extract and Spearmint Extract. Gradually replace your dog’s regular food with Wishbone over a seven-day time period. 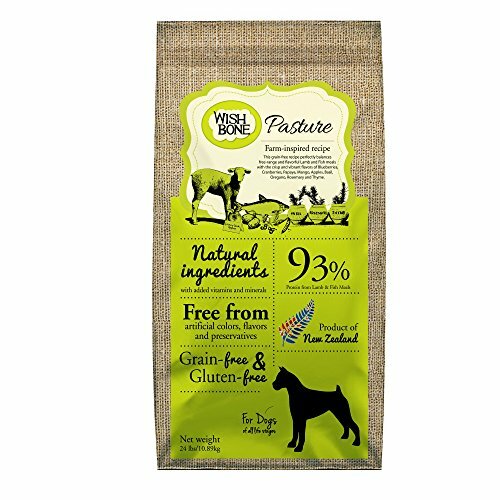 Wishbone is highly digestible so even sensitive dogs usually have no problem transitioning. The above feeding guidelines will need to be adjusted for activity level and age. Puppies and pregnant or nursing mothers may need three times or more the amounts listed above. Split up feedings throughout the day. The product and format are great for large dogs, but the cost is prohibitive. I love the care that Wishbone has taken to produce a quality dog food and there are definitely a lot of companies that could learn from their philosophy. If you have a small or medium sized dog then this formula could work well for you. Since you are not paying for a ton of fillers, a single bag lasts a long time.